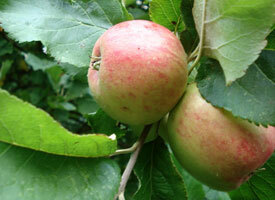 The Mike Rowney apple variety stems from a tree grown from a seedling in the garden of Mike and Anne Rowney, Litlington during the 1980s. It is currently cultivated as part of Brighton Permaculture Trust’s -:- National Collection in Stanmer Park, Brighton. The Mike Rowney apple is medium sized and round with a yellow, greasy skin flushed bright red with darker red streaks and white lenticels. The basin is ribbed with an open eye. The cavity is narrow with a medium length stalk. The flesh is sweet and chewy with some acidity and is sweetly aromatic. The apple can be stored until November. The tree is moderately vigorous with an upright-spreading shape.